Over the years, gift cards have become a favorite gift. You don't have to worry about color or size, and there is one for every taste. Shipping costs are minimal, and you can purchase them almost everywhere. If you get a gift card for somewhere you don't shop, or for a store that's not in your area, there are websites where you can sell or exchange them for cash. However, gift cards have their drawbacks. Some people think (like cash) they are cold and impersonal. One local store in my area has gift cards for places that are more than 100 miles away from where I live. The largest drawback for gift cards is now they are subject to elaborate scams. 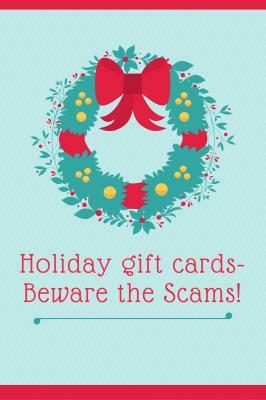 So, if you are thinking about purchasing gift cards this holiday season, watch out for these top three scams. Thieves remove gift cards from a display. They record the card number and put the card back on display. Scammers then wait until a customer buys the card and checks online for a dollar balance to appear. The card information is then used online or sometimes a duplicate card is made to use in the store. This scam works best when there are a small or controlled number of cards available, like at smaller merchants. In larger stores, the gift cards near the register or on end caps are the most likely targets because they will be purchased more quickly. Watch for people who try to push a particular card for sale. In larger displays, compromised cards are most likely to be at the front of the group. Choose a card from the middle or back or from an area of the store that is less frequented. These are cards that would cause thieves to wait longer for their redemption. Some manufacturers have been adding special packaging or scratch off pin numbers to prevent thieves from just being able to look at the cards and stealing the numbers. While it has deterred some theft, some thieves have continued to figure out ways to access the money. Some open up the packages, take the numbers and try to reseal them in hopes that hurried shoppers won't notice. Some scratch off the covering on the pin number to access it and either leave it exposed or try to cover it back up. Either way, once you purchase the card and load it with money, they are ready to steal it. Watch for packaging that looks like it may have been tampered with by checking with other cards in the rack. Checking the seams of the packaging for misaligned or re-glued packaging could prevent you from giving an empty gift card! Make sure the scratch-off covering on the pin number looks untampered. If you find packaging that looks suspicious, give the cards to the cashiers and choose another one-preferable from the back of the display. While most store employees are hard-working, honest individuals, some are not. This scam works when the store employee is in on it too. You had your card to the checkout person for purchase and activation. The cashier then activates a different card and hands you back the inactivated card. (Sometimes they activate your card but hand you back an inactive one) either way, the store clerk is collecting activated cards loaded with money. Watch out for clerks that seem distracted or that try to distract you. Keep your eye on the card and make sure it is handed back to you immediately after activation. Double check that the gift card number on the activation receipt is the same as the number on your card. If not, call for a manager. So you received a gift card that you don't want and choose to sell it to someone else for cash. There are a couple of scams you need to be aware of. Say a person lists a gift card (or a merchandise credit) for sale on a classified site or on social media. When the offer is made, the buyer wants to be sure that the balance on the card is what the seller reports it to be. This seems to be a logical and good consumer practice. The buyer then asks the seller to be a part of a three-way call with the gift card company to listen in on the balance of the card. The buyer records the touch tone numbers entered and intercepts the card number. Then the fake buyer uses the gift card number without paying for the card. Watch out for people that want to listen in on a balance inquiry call or wants to look over your shoulder while you make such a call. It is probably a scam. 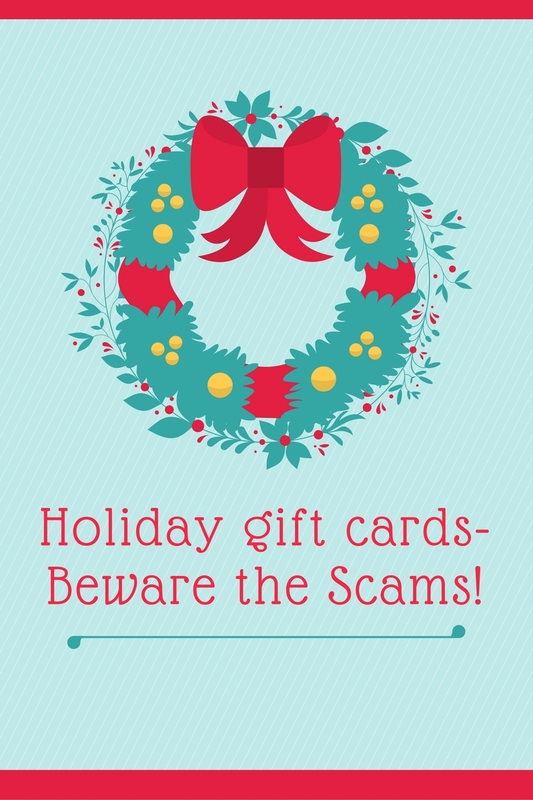 To avoid this, only sell your cards to reputable gift card re-sellers that offer a money back guarantee. There are also gift card kiosks but make sure they offer guarantees in case there is a problem with the card. Similar to the above, the double dip works because of the profitable resale market for gift cards either selling unwanted cards or purchasing cards at less than face value. Many online re-sellers accept the codes from the back of the cards to shorten the time between buying and selling the cards and shipping the cards to the purchaser. Scammers, sell their codes and then quickly use the actual gift card leaving a worthless code for the next purchaser. Sometimes the re-seller will discover the deception, but often it is the unlucky buyer. Watch for re-sellers that provide a guarantee rather than purchasing from an unknown individual. You may be able to get a bigger discount from the classified seller; you are taking a much more significant risk. Grab a gift card from the middle or back of the display, not the top. Check the balance in private. Only buy and sell gift cards from reputable sellers/re-sellers that offer guarantees. Have a happy and safe holiday buying season!